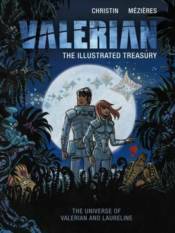 Valerian: The Illustrated Treasury is an illustrated encyclopedia of the Valerian and Laureline comic-book universe, featuring information on key locations (including Central Point), transport, galactic anomalies and a timeline of the major events in the series. This richly illustrated book also introduces many of the alien races and characters friendly and hostile and there is a special section on the ever-popular Shingouz. A fascinating collection of colour illustrations and sketches produced by Valerian and Laueline artist Jean-Claude Mzires in the 1980s and early 1990s. In addition to various pieces of Valerian art, It also includes examples of his advertising work and concept designs for film projects.